1. Copy the data table below into your Science Journal. 2. Place 4 cm of soil in the jar. Pour 30 mL of water into the jar to moisten the soil. 3. Place 2 cm of grass clippings or green leaves on top of the soil in the jar. 4. Use a marker to mark the height of the grass clippings or green leaves in the jar. 5. Put the jar in a sunny place. Every other day, add 30 mL of water to it. In your Science Journal, write a prediction of what you think will happen in your jar. 6. Observe your jar every other day for four weeks. Record your observations in your data table. 1. Describe what happened during your investigation. 2. Infer how molds and bacteria help the process of humus formation. 3. 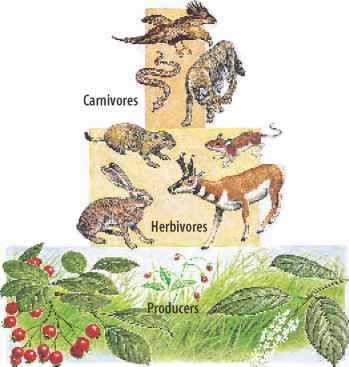 Infer how humus forms on forest floors or in grasslands. Compare your humus farm with those of your classmates. With several classmates, write a recipe for creating the richest humus. Ask your teacher to post your recipe in the classroom. For more help, refer to the Science Skill Handbook.